At the 2008 Summer NAMM Show in Nashville, TN, Future Sonics is unveiling its revision 2 edition of the acclaimed Future Sonics Atrio professional earphones. This revision includes improvements that respond to musicians, engineers, producers, production companies, plus excellent consumer responses and the company's own research and development, but with no MSRP price increase to the end-user. “We were able to listen to our clients and respond to the things they’ve asked for while maintaining our signature sound,” states Marty Garcia, founder and president of Future Sonics. This new update is recommended for a wide range of applications including the live concert stage, recording studios, broadcast applications, and house of worship. Atrio is also the perfect companion for advanced gaming and digital media players like Apple's iPod, iPod Touch, iPhone, Microsoft Zune, Sirius and XM Satellite receivers and much more for those consumers who want professional audio quality from their personal digital media devices. The Atrio 2 maintains high energy and feel with bass response accuracy, natural midrange for true-to-life vocals and instrumentation, detailed treble without "bite", 100% armature-free studio-grade MG5pro drivers, crossover-free acoustic architecture, multiple comfortable fitting options, and optional SofterWear custom-fit availability. New features include QuietCables II for excellent audio quality, more flexibility, less tangling, and more comfortable fit around the ear, improved performance with TrueTimbre frequency response of 18Hz - 20,000Hz for even more natural sound quality with less need to crank up the volume to achieve the wider range of audio quality, and improved cable slider for more secure positioning and greater comfort when cabling is worn behind the ear. Atrio professional earphones use a single studio-grade dynamic driver that is designed and manufactured by Future Sonics. The universal fit of the Atrio professional earphones also offer multiple options to satisfy individual preferences and ear sizes. Included with the device are three interchangeable pairs of Future Sonics designed EarFills dual-flange silicon sleeves (small, medium and large) that allow the earpiece to fit snugly in any size ear canal. As another option, the Atrio professional earphones come with two pairs of Future Sonics specially designed ComfortFit foam sleeves (large and small); these sleeves can replace the EarFills for wearers who prefer a more complete seal of the ear canal. 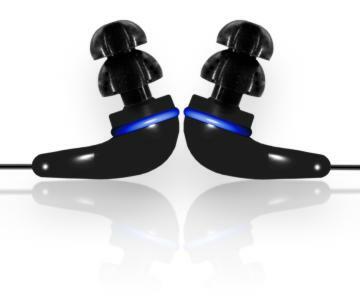 The Atrio professional earphones are available in model m5 edition (onyx black), and model m8 edition (cobalt blue) with the only difference being their color. Both models include a premium-quality protective carrying case. © 1997 © 2008 Pro-Music-News. All rights reserved. Thank you for visiting Pro-Music-News.